This is a Mucha classic by any criterion. From the circular motif and refined composition to the bold and harmonious use of color and type, even down to the deliciously designed hands, as L'Estampe et l'Affiche said in 1898, it all comes together with unsurpassed grace, beauty and force. 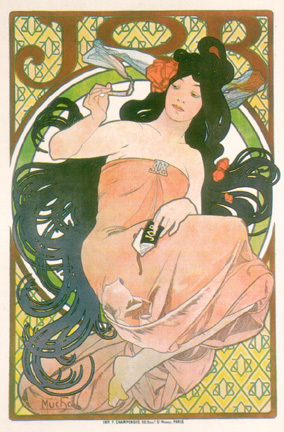 This is Mucha's second poster for Job. It's also interesting how Mucha placed the Job brand throughout the poster, the wallpaper, the brooch and of course on the product itself.